In this lab session, we discussed our plans for the midterm project. 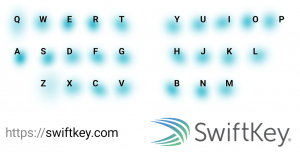 I personally plan on using the data collected from Swiftkey, a virtual keyboard, to be used as a part of my midterm. The data shows me which key I use the most whenever I’m on my mobile. However, as shown here, the data is visualised in terms of opacity. I plan on using photoshop’s dropper tool to see where in the RGB spectrum does the colour falls. If the eye dropper shows a colour that falls on the lower part of the RGB spectrum, it means the colour is darker and it means I’ve used the key rather frequently and vice versa. 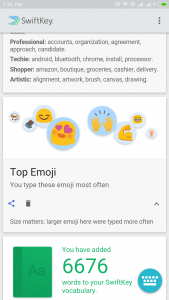 I’m also considering using another data from Swiftkey, that is the kind of emoji I used very often. I plan on comparing the scale of the visualisation above to get the quantitative data of the Top Emojis. I look forward to using Adobe Photoshop to work on analysing and visualising the data above.